Join Camp Fire for a daylong conference just for teens to build leadership skills that will prepare you for the school year ahead. Workshop sessions will include topics such as communication and team-building, mindset management and fighting negativity, and goal-setting. This event is a great way to learn about Camp Fire programs like Teens in Action and the Spring Break Road Trips and kick-off the year ahead! Find your youth voice and learn to put it into action! No prior experience in Camp Fire, Camp Sealth, or program membership required – all are welcome! Lunch and all workshop materials will be provided by Camp Fire and is included in your registration fee. Please let us know about any allergies or special diets – we can accommodate most dietary restrictions. Please contact Alex Kirschner, Community Programs Manager, at (206) 826-8919 or alexk@campfireseattle.org with questions. 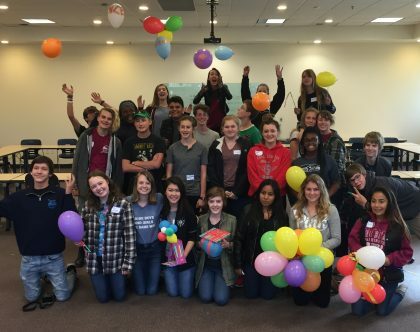 Bring your whole group to our Teen Leadership Summit! Leadership groups from schools, sports teams, other organizations, and more are welcome. Please contact us for information about group pricing. Camp Fire Central Puget Sound offers a variety of Teen Programs throughout the year. Discover our extensive summer leadership programs and our school year Service Days, Retreats, and Spring Break Service Trips, and learn more about our mission and philosophy of providing youth with opportunities to lead, grow, find their voice, and make an impact on their communities.